Hello and Namaste, welcome to Nepal, have you had anything to eat today? My name is NJ Adhikari and when you explore Nepal Adventure trip; your answer will always be “YES”. With nearly two decades of experience in the industry, my biggest focus on treks - your comfort and safety - has never changed. Preventing physical injuries, diseases, and altitude sickness is just as important as having the confidence and expertise to treat these maladies if they do occur. Experiencing the magnificence of Nepal’s nature with over one thousand international trekkers has allowed me to gain the necessary technical and medical skills to ensure your comfort and safety. Nepal’s exotic environment makes communication very important, so I developed the TIC technique to help you get the most out of your trip. T stands for timeliness. No Surprises. You will always be involved in the planning and scheduling process. It is my business to share any updates, new possibilities, and necessary modifications with you as soon as possible. I stand for information. Whether you are interested in learning about Nepal’s natural wonders, language, politics, history, economy, etc… during our adventure, tuition is free! C stands for caring. I care about your dreams, needs, traditions, dietary preferences, etc… You can count on the utmost flexibility as long as it does not compromise your safety. We are specialist for the hiking/trekking/ Trekking guide and Porter Service/climbing/ sight seeing/ mountain flight/Transportation all over Nepal/ ticketing/ Hotel reservation etc . Namaste & Welcome to the home of Mt. Everest. I have been successfully leading trekking & tours in Nepal & some part of Tibet from various reputed Tour/Trek company . I am leading as a freelance trekking guide; I've completed my Trekking guide Course from Ministry of Tourism and at the high altitude medical training trekking guide. I will be more than happy to guide you on the most beautiful trails in the Himalayas, with a purpose to ensure your holiday best & unbelievable as per your desire & that tour could leave a vast experience in your mind. As a guide, I will take you to those unexpected places where you can enjoy your each & every moment with full of joy & happiness & where you can get plenty opportunity to explore the world's most beautiful, interesting and exciting places of culture and natural wonders, guiding you clearly & facilitate you to experience high adventures set against the brilliant backdrop of the Himalayan range - setting. If you are planning on trekking in Nepal Himalayas, take this opportunity to get in contact with your hired help directly as a substitute of going through trekking company. It is best way to help guides and porters in Nepal by Employ directly so, Let Me customize your itinerary with your special interests and needs in mind, whether those interests are in trekking, mountain climbing, wild life safari, river rafting, bird watching, historical places of Nepal & Tibet, I heartily welcome all of you to join us for a unforgettable & amazing adventure. I'm always there to give you cooperation regarding your tour arrangement and I look forward to serve you in the days ahead with better services. Everest base camp trekking is one of the most popular regions for trekking in Nepal. Though trekking is ultimate goal of the most visitors Nepal. You will enter through the Namche Bazaar, heartland of the Sherpas and the gateway to Everest. This place welcomes the thousands of travelers every year. You will see drastic changes in this small if this is your second visit after a long time. This area supports all the facilities needed for the visitors. The lodges, cafes all opened for the travelers, a beautiful modern town which used to be the trade point for the butter and ghee. The trekking industry has made this place one of the prosperous district of the nation. It was possible only after 1953 when Edmund Hillary and the Tenzing Norgay Sherpa who have successfully ascended the Everest. Thereafter, various contributions and establishment of the health, education, facilities in the region have totally change the face and situation of the place and the locals especially Sherpas of here. Thereafter, you will continue your trek to the Khumbu valleys a residential area where you will pass through the small fields of Sherpa peoples. You will see the flag decorated monastries in this Khumbu valley. In this cool and silence environment you will be hearing a small rings of bells , drums , horns and flutes and enchanting of the Buddhist prayers from the monastries and gumbas. A spiritual happiness you will only feel in such sacred places. Your journey continues for the seventeen days to the Everest base camp Trek . You will be coughy, sneezy and a feel tiredness throughout the trek. Nepal trekking tour Trekking in Nepal arranges the tea house trekking and the potter and guide who will guide you and ensure you to be safe through the whole journey. You will never meet peoples like Sherpa who have won the heart of the travelers all around the world. The icy wind atmosphere continues as you ascend towards the Everest base camp. A strenuous journey and full of wilderness, it’s not fully secured but also the joy inside the wilderness at the end when you reach your destination its no matter that you have not reached at the 8848 but the height of 5364 is also a great achievement for anyone throughout the life. A new experience full of memories that you will be collected or included it in your new edition or many of them just inspire you to achieve much more making this just a beginning. 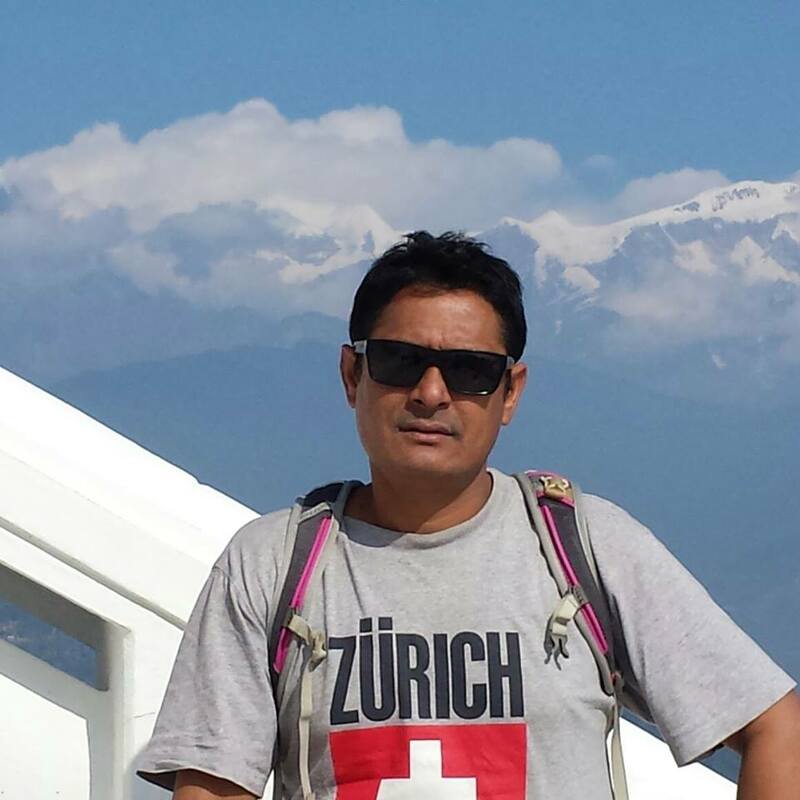 I am NJ adhikari and i am local guide for Annapurna base camp trekking. Annapurna Base Camp trekking is one of the papular and adventure trekking in Nepal. it is 10/12 day trekking from kathmandu to kathmandu.This area is regarded as the one of the most spectacular sancturies in the world. You head north west from Pokhara (a lake resort 200 km West of Kathmandu). From Annapurna Base Camp - 4200 m. - you will gaze upon the majestic giants of the Annapurnas and the famous Fish Tail Mountain , Mt. Machhapuchhere. For centuries this region has been a spiritual retreat for pilgrims from Nepal and India. The Langtang valley is aptly called ‘the valley of glaciers’. Here, mountain rise, soaring towards the sky. The valley offers pine forest, swift mountain streams, rugged rock and snowcapped peaks, grassy downs and meadows strewn with daisies and wild primal. A variety of sights including Buddhist monasteries, a cheese factory, yaks, glaciers and mountain lakes make this trek an exciting one. You will visit Gosainkunda, one of the holiest lake in Nepal, where thousands of pilgrims throng each August to bathe in its cold and spiritually refreshing water. One hour drive brings the trekkers to Sundarijal, the starting point of this trek, where there are sparkling waterfalls flowing down through an oak forest. This trek offers the experience of being in a typical Sherpa village and many ancient monasteries. It is a golden chance to learn about life in our villages. The trek ends at Melamchipul Bazar on the banks of Indravati River. You will now enter a country that has never been occupied by a foreign power, so the people you will meet in Kathmandu and remote villages will convey to you a warm, friendly trust. Benjamn Teng Wong Tee - Malaysia.